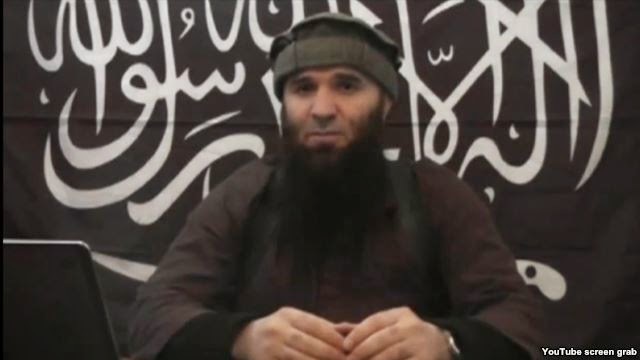 Russia's most wanted man, Doku Umarov, is dead and has been replaced as the leader of an Islamist insurgency in the North Caucasus, a website that sympathizes with the militants said on Tuesday. 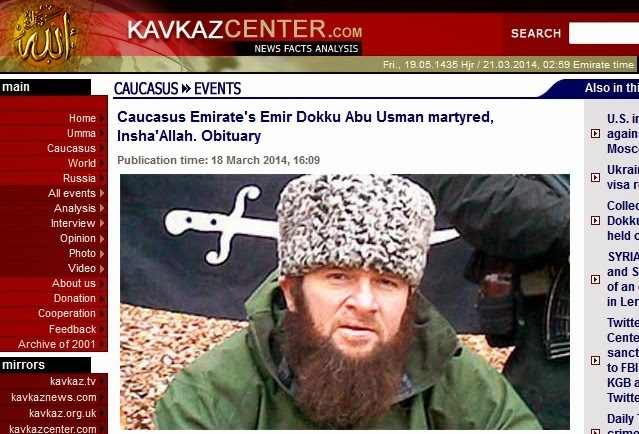 The Kavkaz Centre website issued an obituary, calling Umarov a martyr who had "given 20 years of his life to the Jihad." It did not say when or how he had died, but the simultaneous release of a video address by a militant introducing himself as Umarov's replacement indicated it may have been some time ago. Aliasaskhab Kebekov (aka Ali Abu-Mukhammad), the "qadi" (supreme religious authority) of the Caucasus Emirate proclaimed in 2007 by then-Chechen Republic Ichkeria President Doku Umarov, says he has been chosen to succeed Umarov as Caucasus Emirate leader. In a 12-minute video clip posted on March 18, Kebekov confirms the earlier reports of Umarov's death. He further explains that a six-man "shura" (council) appointed by Umarov has selected him as Umarov's successor. "Overall, Dagestan rebels have always been tougher than Chechen rebels," Sokirianskaya said. "It will be a more battle ready, more ruthless cell, even more integrate into the global jihad." “Information was received about the procurement of a significant number of handguns from a member country of the EU, which were delivered to the territory of Ukraine,” the agency said in a statement. “From there, the weapons were hidden in recessed areas in cars and shipped to regions in the North Caucasus,” the statement added. The future of the South Stream pipeline project to carry Russian gas to Europe has been put in question by the escalating dispute over Ukraine, the chief executive of Italian oil major Eni said on Thursday. The future of the pipeline is "somewhat gloomy", Paolo Scaroni said during a parliamentary hearing in Rome. "It will put into question the many authorisations that European countries must give to complete the project," Scaroni said. This would be neither the first nor the last time the EU acts against its own interests in order to please the United States. But besides rumors that the project is "dead", there are no definite actions so far and the involved companies continue with their work. As the U.S.-led war winds down and Russia reasserts itself in Ukraine and the Middle East, Moscow is also ramping up its investment in Afghanistan. It is rebuilding the relics of the Soviet occupation and promoting its own political and cultural prowess. The Russian government has compiled a list of 140 Soviet-era projects that it would like to rehabilitate, according to the embassy. The Kabul Housebuilding Factory, the country’s largest manufacturing facility, was the first to receive assistance last fall: $25 million in new equipment. Ethnic Turkmens in northern Afghanistan are taking up arms to protect Turkmenistan from the Taliban. Residents of Karkin, Faryab Province, stand ready to defend their homes and protect the border with Turkmenistan from encroachment by Taliban fighters, Radio Free Europe/Radio Liberty (RFE/RL)'s Turkmen service reported March 11. 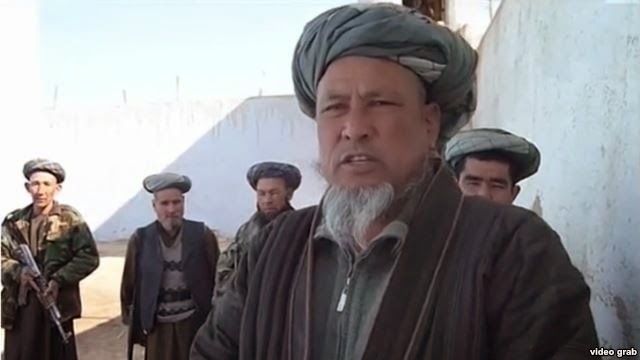 The Karkin men are taking up arms to address the situation brought about by the emergence of Taliban militants in the region, Gurbandurdy, a former insurgent field commander who fought the Soviet invasion of Afghanistan (1979-1989), told RFE/RL. Turkmenistan has called up military reservists to train on its border with Afghanistan following reports of recent skirmishes with Afghanistan-based militants. On March 18 the Alternative Turkmenistan News (ATN) service reported that Turkmen reservists were being summoned to military enlistment offices to "undergo retraining" near Afghanistan. "In particular, several tens of people have been sent to Serhetabad (formerly Kushka) in the country's south in the past few weeks," ATN said, citing "reliable sources.” The soldiers are being housed in separate barracks without leave and are subject to strict military discipline, ATN said: "There is no more information but there is no talk of full mobilization. Our sources in Ashgabat haven't yet received summons to military enlistment offices." In connection with reports of an increase in IMU activity in Afghanistan, Uzbek authorities are discussing ways to keep the terrorist organisation out of Uzbekistan. 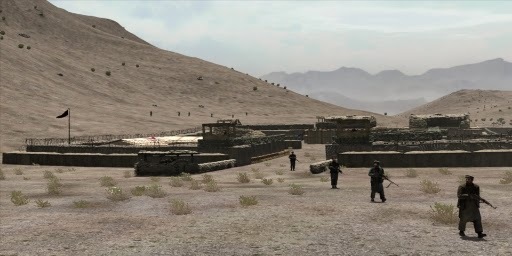 The IMU is numerous in Afghanistan, but Uzbek security forces keep the situation under control, Uzbek National Security Service (SNB) spokesman Khotib S. said. "The IMU has more than 5,000 militants, according to our information," he said. "Just several years ago [they] were mostly based along the Afghan-Pakistani border. Today we are troubled by the combination of increased IMU activity and deployment in northern [Afghanistan], that is, along the border of the former Soviet republics." A member of the Islamic Movement of Uzbekistan, suspected of mercenary activities and terrorism, was detained in Osh Airport of Kyrgyzstan, the press service of the Osh police department reported on February 24. The man, according to the operational data, received military training in Waziristan region of Pakistan within the Islamic Movement of Uzbekistan. Then he moved to Turkey where he actively recruited Kyrgyz citizens to fight on the side of the Syrian opposition. One of former field commanders of the Popular Front of the Popular Front of Tajikistan (PFT -- a paramilitary group that supported the government during the five-year conflict), Davlat Cholov, has been arrested for calling on Kulob youth to fight on the side of antigovernment forces in Syria, a source at the Ministry of Interior (MoI) told Asia-Plus today. “There is suspicion that over the past several months, Davlat Cholov has participated in mutiny in Egypt and on return to Tajikistan he was going to call on young men to go with him to Syria to fight on the side on Syrian rebel forces,” the source said. This week, Tajikistan's Supreme Court sentenced IMU member Alimurod Makhanov, the leader of the terrorist group, which had planned to disrupt last year's sham elections in the Central Asian Republic, to 21 years in prison. The Tajik authorities are very nervous with regards to terrorist activities, as demonstrated by the recent killing of two Afghan fishermen at the hands of Tajik border guards, who had probably mistaken the fishermen for Taliban. The representative office of the Institute for War & Peace Reporting (IWPR) in Tajikistan completed a two-day training workshop on Human Rights Defenders and Media Cooperation on March 17. The training workshop was implemented within the framework of a new three-year project “Empowering Media and Civil Society Activists to Support Democratic Reforms in Tajikistan” supported by the European Union under the European Instrument for Democracy and Human Rights (EIDHR) as well as Norwegian Ministry of Foreign Affairs and National Endowment for Democracy (NED). Civil society in Tajikistan has grown leaps and bounds over the past decade. 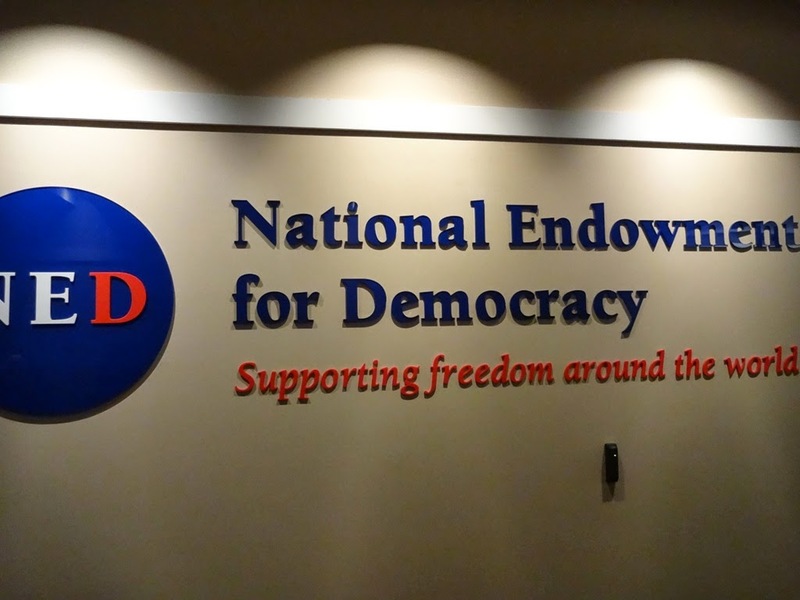 Registered non-profit or non-governmental organizations grew tenfold from 1997, rising from 300 to 3,000 in 2013. Ms. Oynihol Bobonazarova, a pioneer of the human rights movement in Tajikistan, was among 10 women awarded as "International Women of Courage" by the U.S. Department of State. A lawyer by profession, Ms. Bobonazarova is best known for her advocacy of human rights and her work with the Organization for Security and Cooperation in Europe (OSCE) and the Open Society Institute/Assistance Foundation.